The New York Times magazine opens every Sunday with an essay about what a given word or phrase reveals about the moment. This week’s was “anti-aging.” The line at the top of the print version read, “After years obsessing over ‘anti-aging,’ our culture finds itself at an impasse. 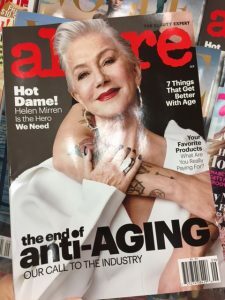 We don’t want to look older—but we don’t want to feel as if we fear it, either.” The catalyst was the announcement in Allure magazine’s September issue that the word has been banned from its pages. Editor-in-chief Michelle Lee commended instead “the long-awaited, utterly necessary celebration of growing into your own skin—wrinkles and all.” Huzzah! But not so fast. As writer Amanda Hess points out in the Times, Allure is still promoting products that promise to make women look younger. The next sentence reads, “No one is suggesting giving up retinol”—God forbid! (It links to an article that begins, “It’s no secret that retinol ticks practically every box in your anti-aging wishlist.”) Titled “The Ever-Changing Business of Anti-Aging,” Hess’s piece is a sharp critique of the re-branding of “anti-aging”—it’s just another opportunity to sell us the same old stuff. Campaigns have changed over time, from cautionary tales to aggressive pitches grounded in “science” to appeals to the easy and “natural”—from shame to combat to self-care. Women are ready to join forces! Thanks for this astute update. And no thanks to Kim Jong-Un for reviving the word “dotard” and applying it to Donald Trump, thereby dealing a double insult to old people. Buying my book today as I want to be part of a growing (and much needed) conversation. Thank you! As a senior living woman, this article brought forth my hero and my mentor, Betty White. Her life’s attitude and beauty with every wrinkle is a mark of aging at it’s best. In my opinion, those who say they are anti anti aging do not really understand what they are talking about. How come you take medications for your illnesses when you say you are anti anti aging? We take medications, go to the doctor when we are sick because we are anti aging. We want to live longer. Some people just associate anti aging with the outer appearance of a person. Whoever says they are anti anti aging must think about what they are really saying. We take medications and go to doctors because we don’t want to be sick or in pain. Such behavior is anti-illness, not anti-aging. We are aging from the minute we’re born. The goal is health, not youth.